With Windows Phone 7, there was no way to be able to debug your app for when there might be no network connection. All you could do was Build > Deploy > Pray. With the release of the Windows Phone 8 SDK, that’s now changed. Load your WP7 or WP8 project into Visual Studio 2012, choose one of the Windows Phone 8 emulators, then click Tools > Simulation Dashboard and check the Enable Network Simulation checkbox. If the emulator you chose isn’t already running, it will run it for you. 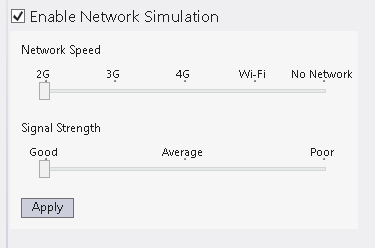 From here, you choose the quality and speed of network, which includes No Network as an options. Worth noting this simulation dashboard also lets you simulate reminders. This is a little weird, because i am doing a network check with NetworkInterface namecspace before initializing. It actually works on a real phone but it is not debugable with this dashboard. While the nonetwork setting selected from the dashboard and applied, my app passes the networkcheck i make in code then unable to download the data.